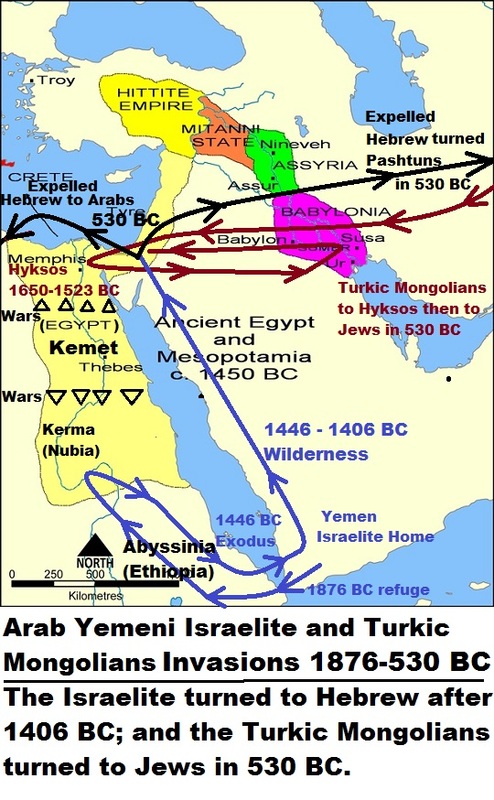 Therefore, the Israelite Exodus was only within Punt, from one region to another. 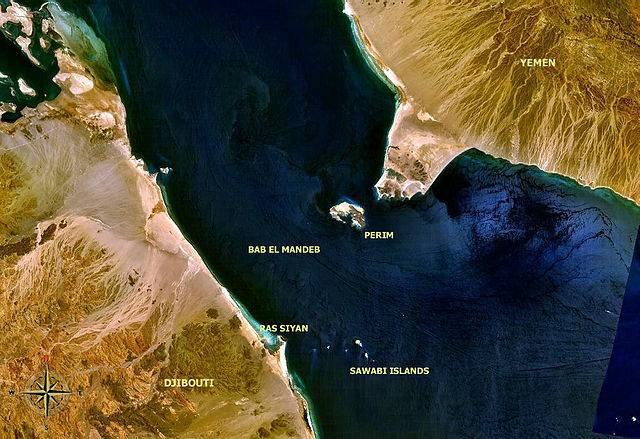 The Bab-el-Mandeb (Arabic: lit. “Gate of Tears or Sorrows”) or Mandeb Strait is a strait located between Yemen on the Arabian Peninsula, and Djibouti and Eritrea in the Horn of Africa. It connects the Red Sea to the Gulf of Aden. The strait derives its name from the dangers attending its navigation, or, according to an Arab legend, from the numbers who were drowned by the earthquake which separated Eritrea and Djibouti from Yemen or Arabia. The full width of the Strait of Bab El Mandeb is about 28 km and it had been in use for many thousand years for movement of goods, people, and slaves. Camel was introduced to Arabia from Africa and were shipped by crossing this strait. Incense, rare woods, feathers, animal skins, frankincense, and gold were among the trade crossing regularly. 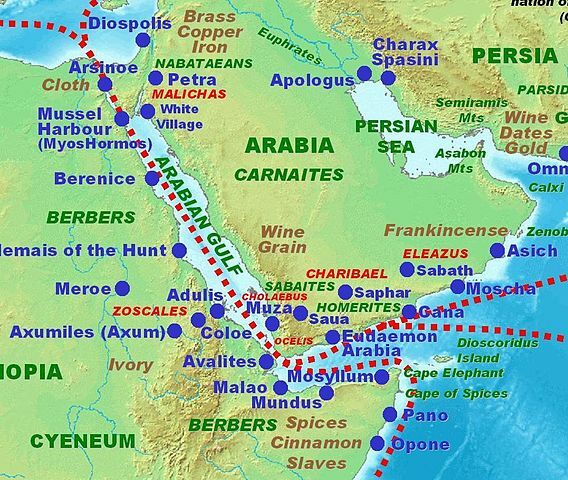 Since ancient times, Arabs imported goods from Africa via Bab-el-Mandeb then exported them via the Incense trade land route linking Egypt, the Mediterranean, and Mesopotamia with Eastern and Southern sources of incense, spices and other luxury goods, across the Levant and Egypt with Eastern Africa, Arabia, India and beyond. The economy of the Kingdom of Qataban (in Yemen) was based on the cultivation and trade of spices and aromatics including frankincense and myrrh. These were exported to the Mediterranean, India and Abyssinia where they were greatly prized by many cultures, using camels on routes through Arabia, and to India by sea. The island of Perim divides the strait into two channels, of which the eastern, known as the Bab Iskender (Alexander’s Strait), is 2 miles (3 km) wide and 30 m deep, while the western, or Dact-el-Mayun, has a width of about 16 miles (25 km) and a depth of 310 m.
According to Ethiopian Orthodox Tewahedo Church tradition, the straits of Bab-el-Mandeb were witness to the earliest migrations of Ge’ez speakers between Arabia and Africa, occurring c. 1900 BC, roughly around the same time as the Hebrew patriarch Jacob (Israel). This could even go older than that to the time of Abraham. The Kingdom of Aksum was a major regional power in the Horn of Africa. It extended its rule across the strait with the conquest of the Himyarite Kingdom shortly before the rise of Islam; and early Muslims took refuge in Abyssinia. Moses may have received some geological assistance when he parted the Red Sea to let the Israelites through. For the past 30 million years the Arabian tectonic plate has been moving away from the African (Nubian) plate at the Red Sea. But the rift, in which Earth’s crust is being stretched and thinned, is not happening smoothly. Most of the time the plates are stuck together. But in September of 2005 they split apart along a 37-mile (60-kilometer) section in Afar, Ethiopia (Ethiopia map), near the southern end of the Red Sea. The studies suggest that the splitting is due to the injection of underground magma (molten rock) into the rift rather than earthquakes happening on tectonic faults. A similar event occurred in Iceland from 1975 to 1984, but it took nine years and 20 individual “rips” to achieve what happened in Ethiopia in just a few weeks. Also see: Cyclopedia Of Biblical Literature Ed John Kitto Vol 1 1880, page 30.